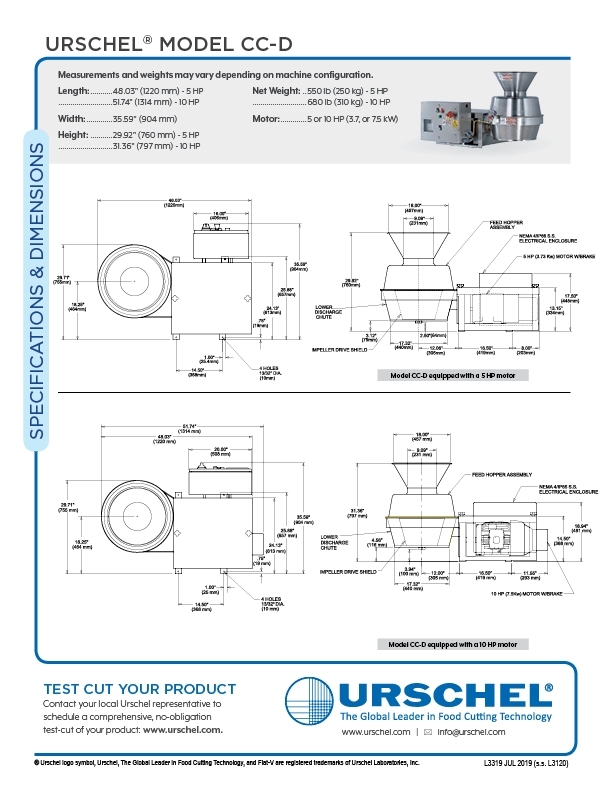 Model CC-D Shredder - Urschel Laboratories, Inc. The Model CC-D uniformly produces several different types of shreds including Oval Shreds, Full Shreds, "V” Shreds, Flat-V™ Shreds, and Crescent Shreds. Available 5 or 10 HP (3.7 or 7.5 kW) motor. The Model CC-D will accept products measuring up to 3-1/2" (89 mm) in any dimension. Food processors choose the Model CC-D to shred, slice, strip cut, or granulate a variety of products including cheese, coconut, cranberries, potatoes, other fruits/vegetables, cooked meats, surimi, and pet food. 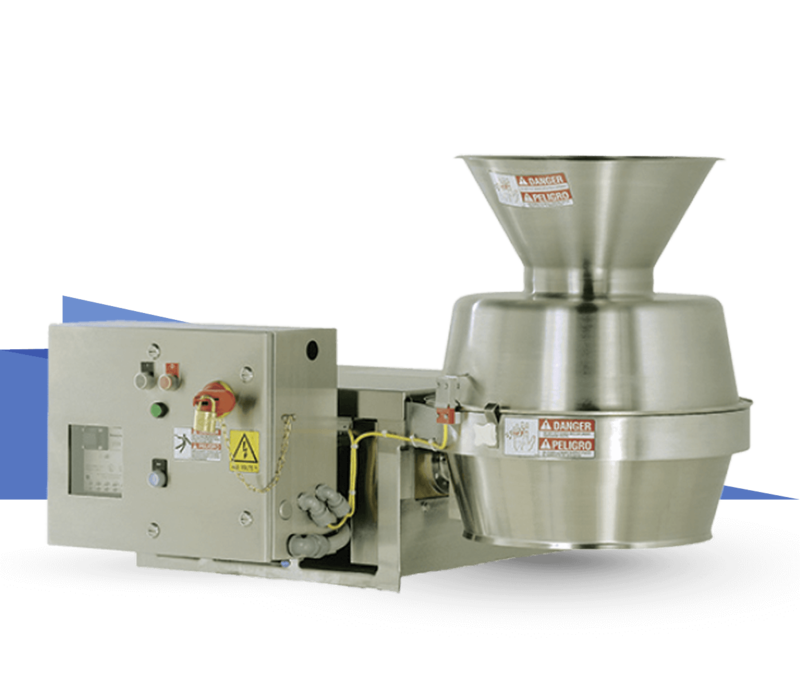 Available in all stainless steel, the machine features continuous operation for uninterrupted production and is designed for easy clean-up and maintenance. The Model CC-D will accept products measuring up to 3-1/2" (88.9 mm) in any dimension. 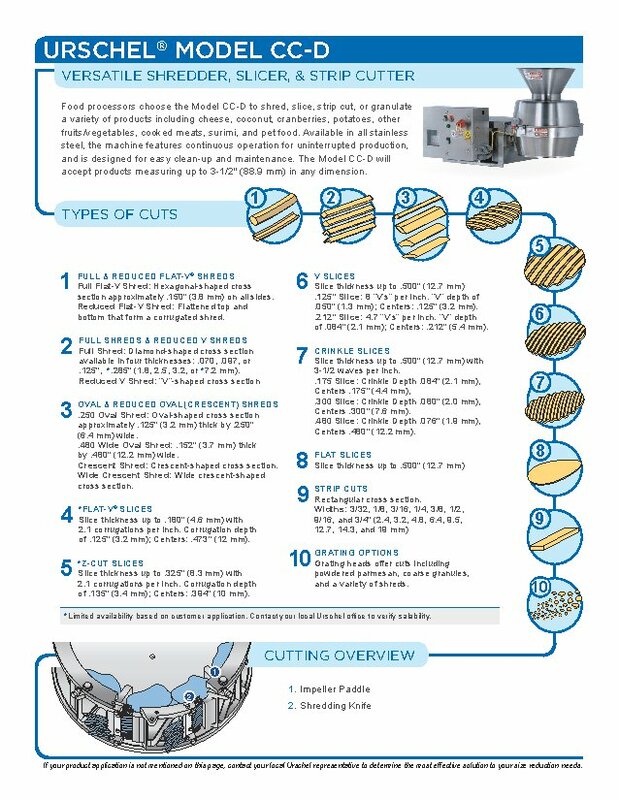 The Model CC-D features maximum flexibility through different types of cutting heads including Flat Slices, Strip Cuts, Full Shreds, Oval Shreds, "V” Shreds, Flat-V™ Shreds, Crescent Shreds, and new Grating Options. Equipped with stainless steel contact parts, the machine features continuous operation for uninterrupted production and simplified design for easy clean-up and maintenance. The Model CC-D will accept products measuring up to 3-1/2" (88.9 mm) in any dimension. Many different types of products can be sliced/shredded using the Model CC-D for a variety of applications including, but not limited to: shredding cheese for pizza toppings, tacos, or salads; shredding potatoes for hash browns, shredding carrots for salad preparations, and slicing of various fruits and vegetables. 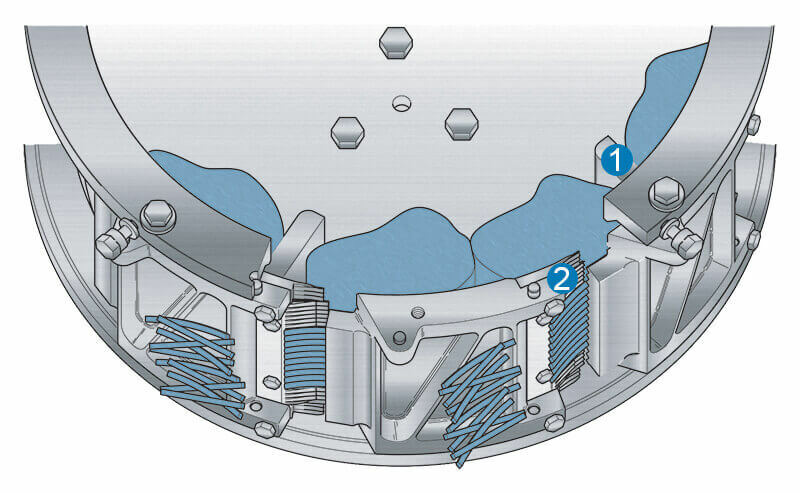 Product enters the rotating impeller [ 1 ] and is held against the inner surface of the cutting head assembly by centrifugal force. The cutting head assembly consists of eight individual stationary cutting stations. Slices or shreds are produced as product passes each knife [ 2 ] in a smooth and uninterrupted manner. Length is controlled by input product size.